Plasmatechnologie GmbH develops plasma coating and surface treatment procedures and builds the systems necessary for applying them on an industrial scale. 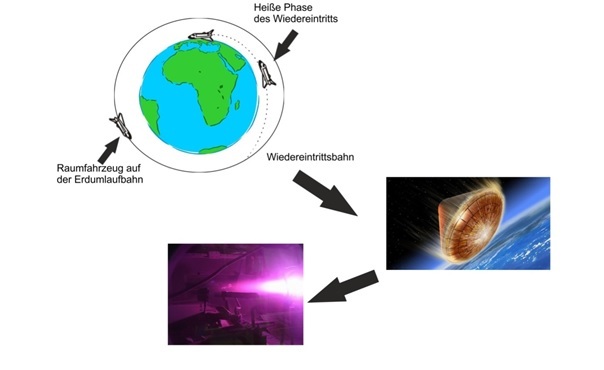 Our technology is based on the idea of using energy-rich plasma for industrial purposes, much the same way it is used to simulate the re-entry of spacecraft into Earth’s atmosphere. One exceptional aspect of these coating processes is the quick formation of high-quality layers it enables. This makes it possible to coat large components quickly and cost-effectively in great numbers. We find the right solutions – even for coating and surface treatment of large components with complex geometries ranging from glass tubes to shaped sheet metal and entire vehicle bodies. .
Our product range covers transparent corrosion protection coatings , optical coating, as well as metallic and ceramic layers (SiO2, ZrB2, etc.). Our systems can even process metals with extremely high melting points, such as tantalum and tungsten. Beyond that, we develop processes for plasma-based surface activation and hardening paintwork using UV radiation. Another project is the direct reduction of quartz sand (SiO2) into pure silicon for applications in the photovoltaic field.